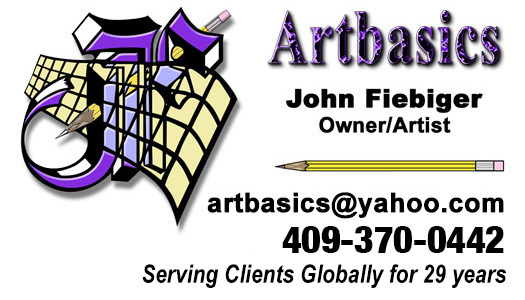 Artbasics was founded by John R. Fiebiger in Orange County California after he realized that there was a significant need for fine advertising in the area. What began as a small neighborhood art shop has become a very successful unique full service design business. We offer very high quality, broad design and quick turnaround service that few can match. We guarantee your satisfaction whether you are a large established firm or a one man shop. Since then, John has returned to Houston to offer everything LA had to teach in the online and printing worlds. Our services include: Branding, Logos, Business Cards, Flyers, Brochures, Trifolds, Signage, Cinematic Posters, Book Covers, Menus, Photography, Image Compositing, Photo Restoration, Photo Scan and Archive to DVD, 3D Design and Rendering, Web Design, Photoshop Tutoring, Engineering, and Illustrating anything and everything under the sun. Please take your time in reviewing the samples provided. What is available is a minimal scratch on the surface. Should you require something much more specific, email me and we will send samples.